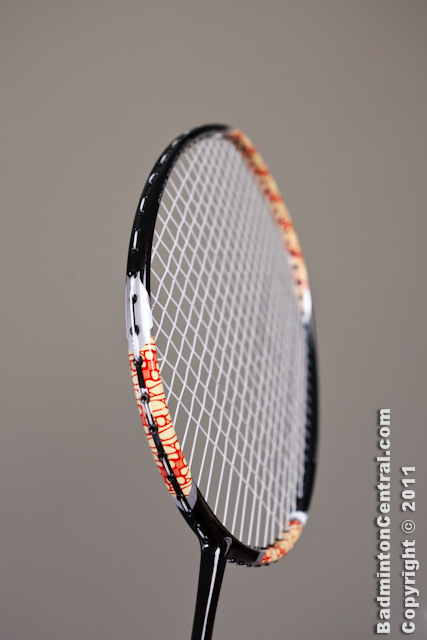 The Kaldera 779 is the 3rd Flypower racket i tested. The Kaldera 779 is a thead heavy racket that is suitable for lower advanced player. Let’s first start with the aesthetic of the racket. 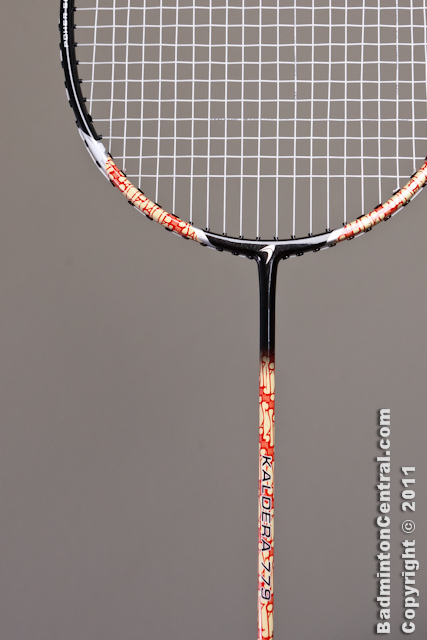 The Flypower Kaldera 779 has very striking and unique design, The racket is an interlude between a red/cream colored batik pattern and solid black color. The very ethnic red / cream color pattern occupid the bottom ⅔ of the shaft, the 5/7 o’clock as well as the 11 to 1 o’clock of the frame. At the 3/9 o’clock black positions has writings of “Superior Graphite” and “Power source system” which gives a hint on how the racket actually plays. Top it off with some white and silver accents completes the design. This original design stem from the Indonesian origin of the Flypower brand and really make the racket design very unique indeed. Whether one likes the pattern might boil down to personal preference. I certainly would not be held back by the design but some customers might. 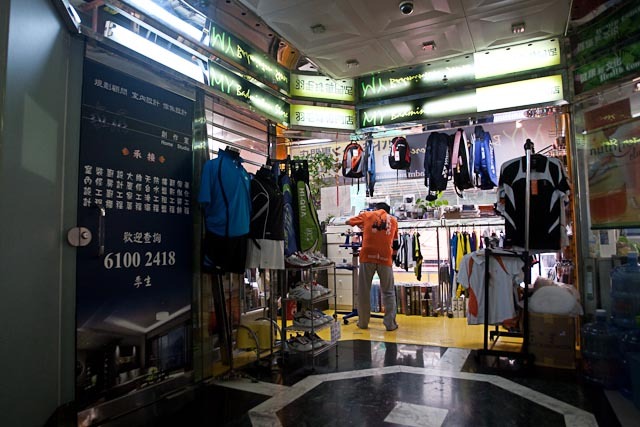 And especially when one finds out how well it plays, the appearance might not be an important factor anymore. My sample racket weighs in a 87.5 grams and a balance point of 298.5mm which puts it squarely at the heavy offensive range. The mainly Batik styled non-tapered shaft measures a uniform 7.2mm in thickness throughout. The thicker shaft means a stiffer feel which agree with my dry bending test. The frame shape is a mid-isometric shaped. The bottom part of the frame starts with a box-shaped profile with a thickness of 10.5mm and taper down to a thickness of 10.15mm at mid-frame and then down to 9.75mm at the top of the frame. A pretty standard 72 holes shared holes pattern which seems to be preferred by many of the attack oriented rackets, this finishes the mechanical design of the frame. I have not received any information on the actual material used. The racket held up very well on the stringing machine despite being laced with Victor VS850 string at a high tension of 28.5lbs. The racket didn’t budge at all under those forces. The recommended tension of 28-30lbs thus to me feels a bit conservative and i believe it can easily hold a few more pounds. Grommets are the standard Flypower issue. Thin non-shared grommet that let’s the string hugs the frame tightly to give better feel, as well as generously wide shared grommet which made threading the shared hole quite straight forward. The Kaldera 779 has a pretty hefty balance. 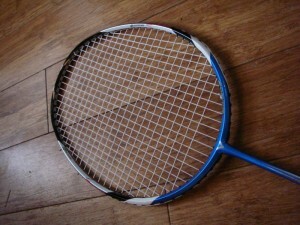 It is apparently when comparing against other Flypower offerings like the Tornado 900. 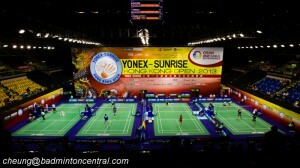 However, in comparison it is still not as super heavy as say a Yonex VT80. While I didn’t receive much info on the composition of the racket, the feel of the racket turns out to be rather excellent. The Kaldera 779 has more forgiving medium stiff shaft that is very lively. The impact against the shuttle is solid and repulsion is really nice on medium strength shots. A mid court smash is merely just a wrist snap and the racket will do the rest of the job. Dampening is well controlled and leans towards underdamped which i really like as it provides very good feel of the shuttle impact. Drive and defense is slightly slow due to the heftier balance but I personally find it is still acceptable. For what it lack in speed it makes it up with excellent repulsion and stability so once impact is made, the shuttle bounces back to the other side fast and deep. Net and push shots are excellent with very good feedback on the impact as well as very good stability of the racket head. Deflection is well controlled. Clears are also not a problem with the Kaldera 779. The medium speed shots give ample time to accelerate the racket and the solid impact feels very good on the clear and drop shots. Smashing is also rather excellent. Most intermediate players will be well match with the smash speed. The higher mass and momentum, as well as lively and solid feel of the racket make it a very suitable offensive racket for intermediate to upper intermediate players with some headroom to grow. Heaviest smashes on this racket comes out with a BOOM instead of a whack sound. Overall I am surprised by the performance of the Kaldera 799. Slightly overshadowed by the exposures of the other series like Tornado and Warriors, I think players should give the Kaldera 779 a deeper look. The head heavy balance, medium stiff shaft and forgiving character is especially suitable for upper intermediate offensive players. It will be an excellent racket for someone who like to attack at the back court.